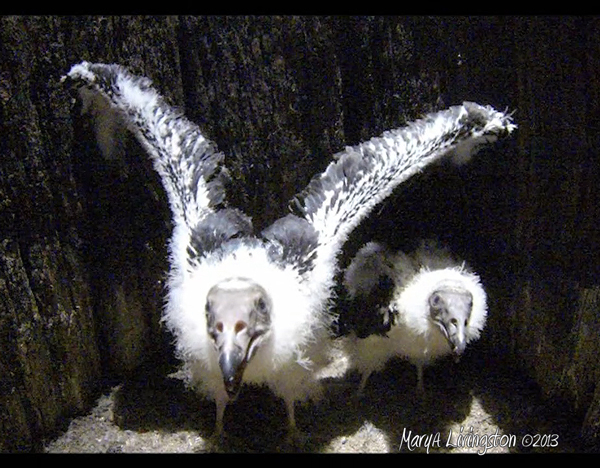 The turkey vulture chicks are about 6.5 weeks old. Most large birds fledge around 10 to 11 weeks. Their chick down is giving way to juvenile feathers. The nest is becoming crowded. Their plumage will gradually shift to dark brown. It will be two years before the skin on their bald heads becomes red. Previously, the chicks just observed and hissed at the GoPro. This time, they lunged at it so it will be the last visit by the GoPro. Soon they will climb out of the deep cavern they call home and begin living in the upper world. At 6.5 weeks old the chicks are changing rapidly. A little camera shy. The red glow is the GoPro record light. No Place for UGLY Birds – a picture book about turkey vultures. This entry was posted in Learning, My Backyard, Nature, Photography, Picture Books, Turkey Vultures and tagged birds, GoPro, turkey vulture, vulture nest by MaryALivingston. Bookmark the permalink. You have done an amazing job sharing information about turkey vultures. Thanks so much for this award worthy series. Hope it is not TV overload. I have a short window while they are growing up in our backyard. Soon the nest will be empty. Wow, they were a lot more aggressive in this video! Nice ot get an update, thank you. Indeed! The bigger one is definitely the more aggressive of the two. Perhaps next year we can find a way to have a live feed camera in the nest. The location deep inside the tree makes it difficult. All babies are cute, no matter the possible ugly outcome as adults! Kind of like inverted ugly ducklings. The do start off cute, I do believe the cuteness is coming to a close. Ugly can be cute. Nice pics for sure. So, you have a picture book about vultures! That’s great. Good luck with that project. Thanks Mary for all your work with this ‘tracking’. I’m sure it’s a once in a lifetime happening, so enjoy recording everything you can. You’ll be glad you did in years to come. I have been watching the new feathers come in and the one in back is not as developed, It may be the younger of the two. Good thing that make GoPro’s tough! Your videos are wonderful. It is interesting how we can now watch the world without leaving our houses. I am so glad you found my blog, so I could find yours! Now they’re getting a little scary! I am so impressed with your scientific efforts! I’m anxious to find out how they get out of that hole. thanks for the news! Your video had me giggling, perhaps you should disguise yourself as a giant turkey vulture! Thank you, again, for posting these. It has been great to follow them. You hit the nail on the head. They clean up the messes. I don’t mind that their heads look the way they do. There is beauty in God’s plan for that, too. Easier to keep clean on the job. I watch them when I see them. I thank them for their job well done. They are so huge!!!! You have honored them well in these posts. Thanks for sharing. It’s so much fun to see and learn from a part of nature we’d never see if it wasn’t for you. Good video. Interesting how the smaller one stays behind and lets the big brother do all the talking. It’s probably a good thing you’ll give up the taping, but thanks for the nature lesson up to this point. We have a good view now that they are coming out of the nest cavity. As with most large birds their chicks have a little age separation. The eldest is often larger and more aggressive. Appears to be the case here. It is nice to watch and learn as turkey vultures aren’t considered as cool as eagles, hawks and osprey.